Meg Braff embarked on her interior design career after attending Vanderbilt University and the prestigious Parsons School of Design. Beginning as an associate at Ellen McCloskey Associates, she later worked with Jeff Lincoln before launching her eponymous firm in 1994. Meg is known for her exuberant, youthful take on traditional design, creating livable spaces imbued with playful glamour and a modern perspective. Her sophisticated color sense and a deft eye for mixing antique and modern pieces have broad appeal, evidenced by residential commissions throughout the East Coast and the Caribbean. In 2011 she acquired the Philip Graf archive and began modernizing and recoloring his playful wallpaper patterns. She also opened a shop, Meg Braff Antiques & Decoration, located in the heart of Locust Valley, NY. Meg emboldens her rooms with charisma and individuality while taking heed to her clients preferences and lifestyles. The result is layered, deeply personal spaces, the ideal setting for gracious living and celebrations with friends and family. A native of Tupelo, Mississippi, Meg is married to Douglas Braff and is the mother of four teenage boys. When she is not traveling for clients she is crisscrossing the country to squash competitions; she also sits on the boards of The Bone Marrow Foundation and The Decorator’s Club. 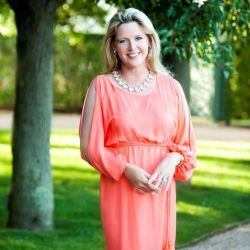 Her work has been featured in House Beautiful, Traditional Home, Coastal Living, Southern Living, and Hamptons Cottages & Gardens, among others. Her first book, The Decorated Home: Living with Style and Joy, was published by Rizzoli in April 2017.